A composed mother-of-pearl panel of rectangular shape, depicting several figures in a Chinese landscape. Two literati on the right walk on a balustraded terrace towards a brick building, where a person can be observed playing a qin inside. Some minute details are incised, such as the decoration on the costumes and the flowers on the grass. The main scene is enclosed in a rectangular frame with ‘rope-twist’ border. The rim features six shaped cartouches, each depicting birds on fruiting branches, alternating with engraved diamond diapers. 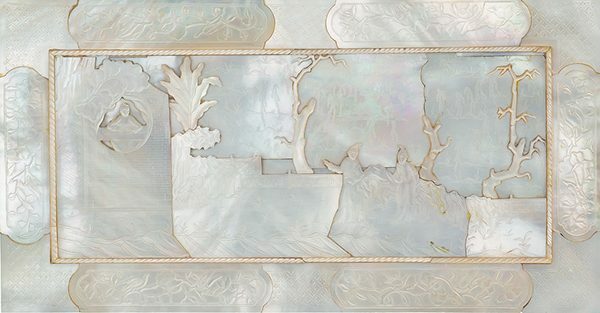 This delicately carved panel was probably originally intended as the side or the lid of a mother-of-pearl veneered box. These panels were made in the Guangzhou area as popular export products during the late Qing dynasty. Two Qing dynasty carved clamshells with figures in a riverside town, comparable in the low-relief carving and the incised detail, but made of a whole piece of clamshell, are in the Muwen Tang collection.